Cetra, like me, can do it. The secret is just up here. 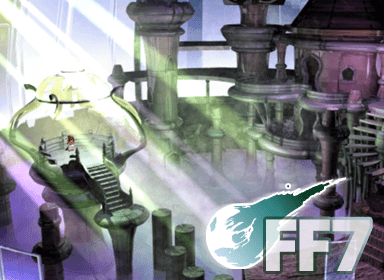 Though Final Fantasy VII was the first to bring mass popularity (and correct numeration) to the series in the Western world, reaction from the core fans of past installments was somewhat mixed; the more science-fiction-like setting upset many fans of the more mediæval settings of previous games (though its predecessor Final Fantasy VI was already noticably heading in a more industrial direction), and some still feel that the characters lacked the depth and individuality of the older games, though this can at least partly be attributed to the somewhat inadequate English translation. The game’s developers admit that it was rushed and unfinished, but still Final Fantasy VII remains a favourite of many. Perhaps this is partly because of the “unfinished” quality of the game: it feels as if you’re playing through part of a story, and that there’s more of interest to the game world than the player will be able to see within the game plot’s short timeframe. Indeed, its relatively inconclusive ending and the numerous glimpses it gives into the world’s past certainly seem to have ignited Square Enix’s imagination of late, with the announcement of both a prequel and a sequel to its story. Whether these will invigorate or crush the mystery that holds fans’ attentions remains to be seen. As is the case with most of the later Final Fantasy games, Final Fantasy VII isn’t especially difficult to finish. Nevertheless, it’s easy to miss out on some of the secrets and sidequests, or get stuck looking for an exit, or just trying to get past one of the tougher bosses. As ever, we'll be doing our best to help you get the most out of the game, whether you’re looking for directions or just browsing the extensive reference lists. So step on into the Final Fantasy VII section. We hope you find it useful. BTB, for information on missable items. Chris “Kao Megura” MacDonald, whose FF7 FAQ set a benchmark which remains unsurpassed.